Pugs are not difficult to train. They are one of the most biddable of dog breeds. They want to please, they want to learn. But most importantly with Pugs, they should not be treated harshly. They do not react well to being shouted at for instance. Commands should be short, simple but firm. Importantly, remember that you and your family are the only ones who can ever teach your Pug what is acceptable behaviour and what is not. It does not know and will never know if you do not teach it. And don’t think that training your Pug can wait until it is older. It can’t. Teaching your Pug right from wrong and good from bad has to begin from day one. Your Pug will be a much happier Pug if it understands that it has to abide by your rules, not his! 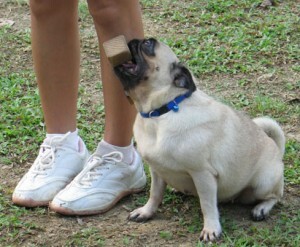 If you need help with training your Pug, there are bound to be dog training classes in your area. There are also many excellent books available on the subject. One we can highly recommend is Training Your Pug by Brenda Belmonte, author of The Pug Handbook.